Early Fender Japan Crafted in Japan era `62 Jazz Bass reissue.Classic 1960s sunburst with the famed "red' tortoise-shell guard that Fender japan became known for over the years. C.I.J. "O" series, 1997-2000 production. Fender Japan Used & Vintage ~SOLD~Fender Japan C.I.J. "S" series Fretless `62 Jazz Bass R.I. In near mint condition, please get in touch for more details. Light weight Fender Japan `75 Jazz Bass reissue in `70's era defining Natural finish, with maple neck & block inlays..Boxes ticked! Still super bright & punchy ,as you would expect from the Ash body /maple neck /maple fingerboard combo. Fender Japan Used & Vintage ~SOLD~Fender Japan DiMarzio Collection `62 Precision Bass R.I.
Fender Japan Dimarzio Collection `62 P bass reissue from about 2006. Near mint condition. More details to follow. Rare & Coolectable later M.I.J. JD Production era Bass VI reissue. In solid 9.9/10 condition , these are getting near impossible to find, even in Japan, now that production seems to have stopped again. Near Mint / N.O.S condition Fender Japan Original Precision Bass Reissue from 2012-13 production. PB51-SD with Factory fitted Duncan Basslines pickup. A rare natural finish Fender Japan `70 P Bass reissue in excellent condition. No major dings or player wear & virtually zero fretwear. Maple fingerboard seems to give it that bit extra PANG when you play it a bit harder. All up, another great example of the P done right in the J. Beyond Rare & Coolectable first M.I.J. era "L" series (1991-92) Bass VI reissue. In solid 9/10 condition , these original reissue series are near impossible to find. The last one I saw in Japan a year or 2 ago was over A$3k. Fender Jazz Bass Special from the Golden Era of Fender Japan production. Made in Japan "E" series, 1984-87. In well above avrage condition for a 30+ year old instrument,frets look untouched. Some minor scars on the lower horn, please get in touch for pics. RARE in lefty,this is the first one we have ever had in! All thump and wallop, has original nylon strings still on it! Definition...NOT!Thump that you can hear across the street.. yep! Cool.. oh yeah!!! Super clean Greco Thunderbird (type) from February 1990. Sounds as good as it looks, plays as good as it sounds. 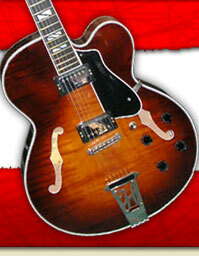 Pickups much closer to orig tone & output of `60s originals than current "G" brand to my ears.